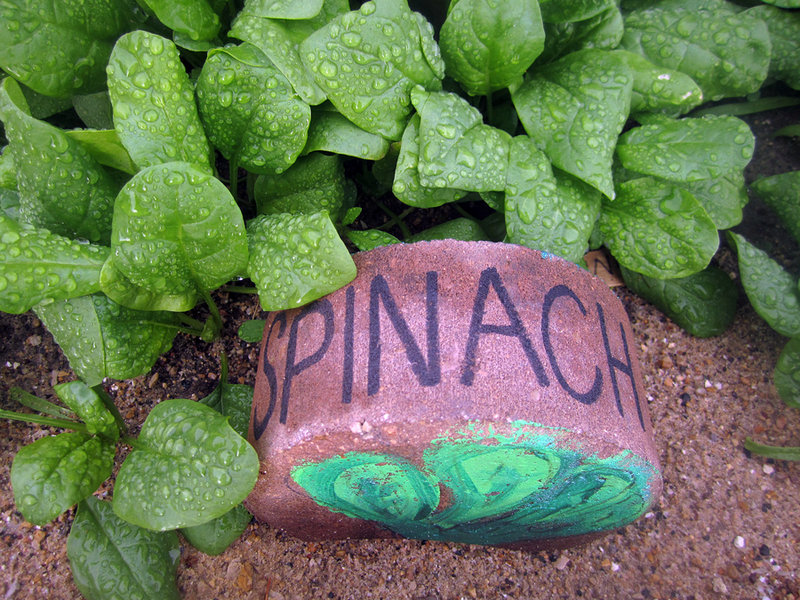 The school year may be over, but the gardening season is just getting started. Thanks to the energy of community volunteers, school staff and a bunch of really excited kids, Mineral Point Elementary School is the proud new owner of 10 raised beds holding over 550 square feet of planting space. The garden, along with its neighbor, the Oak Savanna, was a stop on this spring’s Garden Tour. 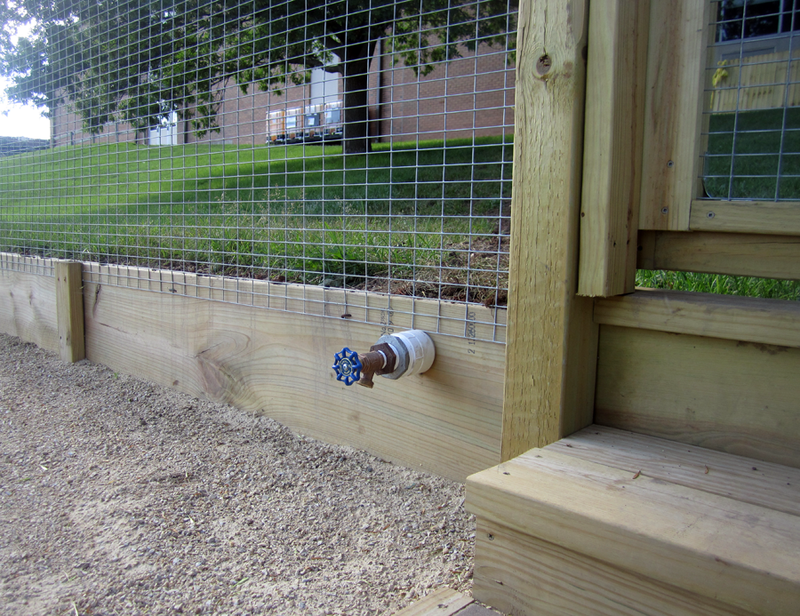 A buried pipe connects a water spigot in the garden to four water tanks located next to the school that will collect rainwater from the roof. In just two months a grassy hill leading to the lower parking lot on Cothern Street was transformed into a fenced, terraced garden complete with crushed gravel walkways and brick paver steps connecting the beds. The next phase, currently underway, is completing the drip irrigation system using rainwater captured from the roof of the school building. 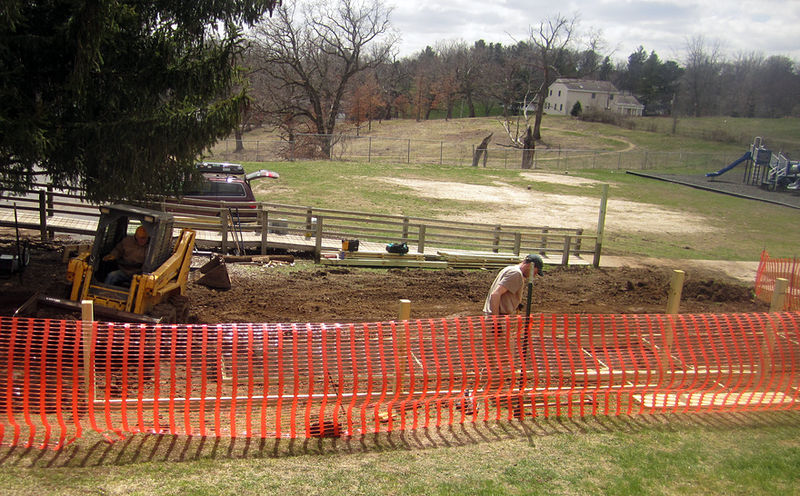 Ryan Fox, right, and John Sharp, operating skid steer, work on the garden in April. 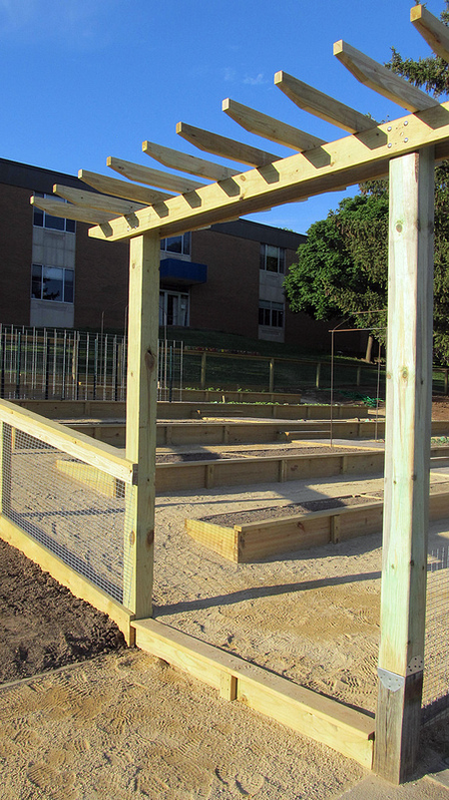 The school community had discussed a school garden before, but with the design and building expertise of master gardener Ryan Fox and seed money from the Wellness Committee and the Super Snacks for Super Kids cookbook project, the timing was right for the garden to become a reality. Along with helping to cultivate and decorate the garden, the kids also watched the garden take shape while Ryan and volunteers built the garden. During recess comments like “Wow, you do good work,” “This is awesome!” and “Where did you learn how to do this?” were overheard. 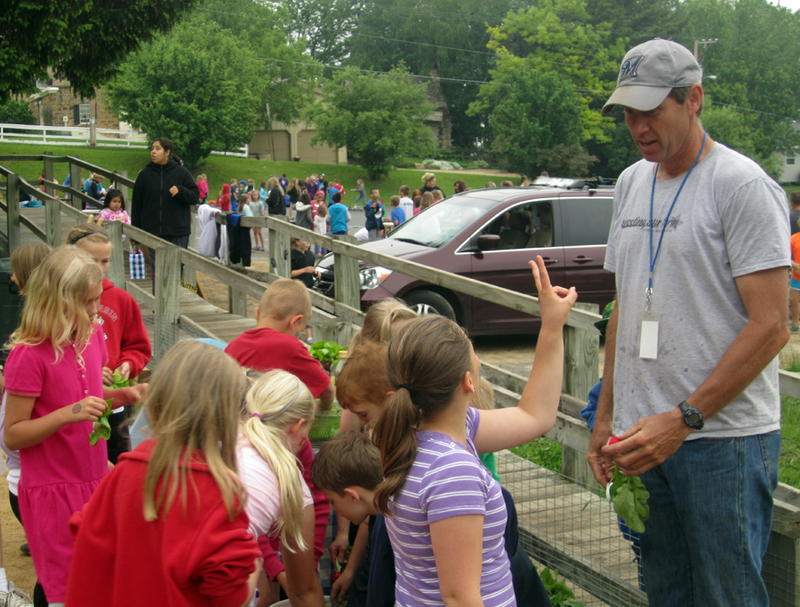 Kids get their hands dirty picking radishes and washing lettuce on the last day of school. Rink (above right) and Jenny Bonde of Shooting Star Farm lent their gardening expertise, deciding where crops would go, donating seeds and plants and also spending time in the classroom. In true Mineral Point spirit, local businesses – including Farmers Implement, Cummins, Shooting Star Farm, Mitchell’s Hardware, Mound City Bank, Sandstone Nursery, Ivey Construction and Shake Rag Alley – were generous with time, funds and supplies. Many families and school staff also pitched in, donating volunteer hours and money. A trellis leads into the garden, ready for climbing vines. 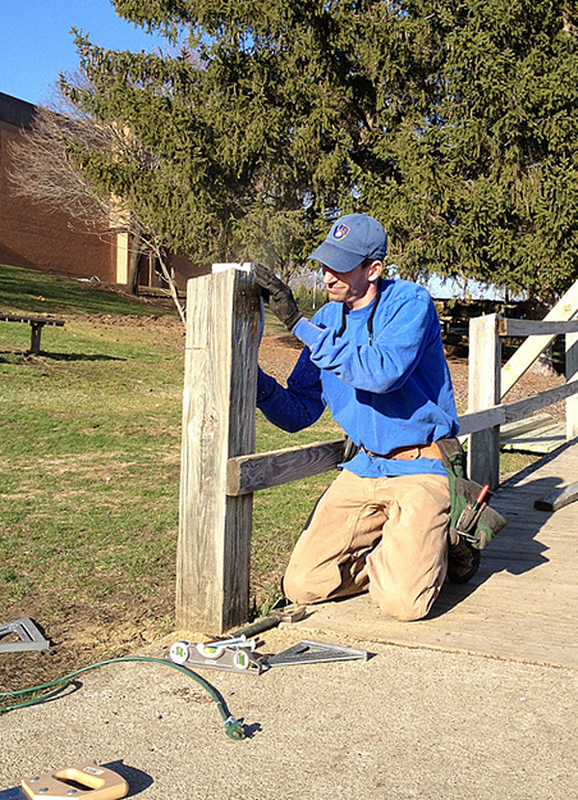 A gate has already been installed to keep the critters out. Harvesting will continue through the summer, and some of the bounty will be served as snacks during summer school. The students, who have voiced pride in knowing that they contributed to the production of such healthy food, will certainly benefit in the years to come from this impressive effort. This entry was posted in Food, General, Outdoors and tagged Cummins, Farmers Implement, Garden, Ivey Construction, John Sharp, Julie Pompos, Mineral Point, Mineral Point Elementary School, Mitchell's Hardware, Mound City Bank, Oak Savanna, Ryan Fox, Sandstone Nursery, Shake Rag Alley, Shooting Star Farm, Super Snacks for Super Kids, Wisconsin. Bookmark the permalink.